Learn about Italian food and cheese tonight at the first Italian Sagra, a cheese festival, hosted by the Italian Cultural Community Center. Enjoy a small-bites buffet and wine pairings with a multitude of cheeses provided by Brazos Valley Cheese, including Van Sormon, Horseradish Pecan Cheddar and Smoked Gouda. Quattro's executive chef Maurizio Ferrarese will guide the audience through a live demonstration of making mozzarella cheese. If you're a cheese-lover, this event is for you. Tickets for ICCC members cost $35 ($45 for non-members). Taste of Australia @ Kemah Boardwalk Saturday, 1-4 p.m. 215 Kipp Ave.
Who needs to fly to Australia when you can just drive there? 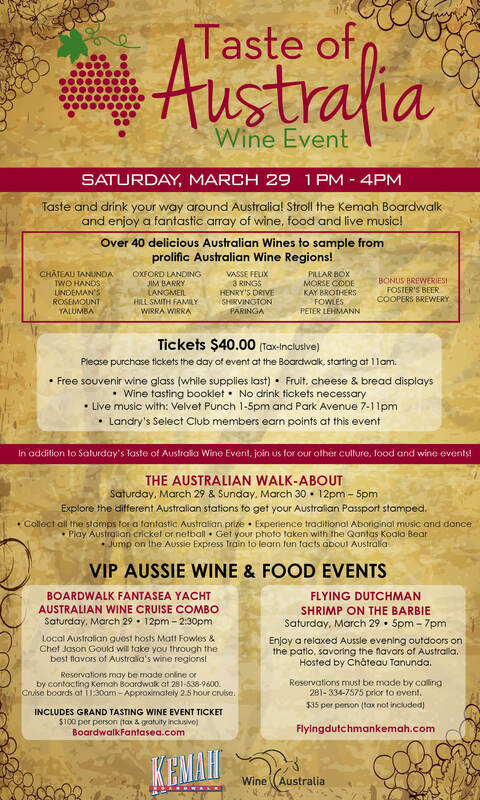 This Saturday, taste your way through Australia at the Kemah Boardwalk from 1 p.m. until 4 p.m. For $40, you will receive a free souvenir wine glass, samples of fruit, cheese and bread, a wine-tasting booklet, and listen to live music throughout the day. Sample wines from Australia, such as Two Hands, 3 Rings, Kay Brothers, Oxford Landing and Henry's Drive. Cooper's Brewery and Foster's Beer will also be available. Tickets must be purchased at the boardwalk. Crawfish Boil @ Tony Mandola's Saturday, 11 a.m. - 9 p.m.; Sunday 11 a.m. - 8 p.m. 1212 Waugh Dr. Sit on the patio at Tony Mandola's on Saturday or Sunday during the restaurant's Crawfish Boil. From 11 a.m. until 9 p.m. on Saturday, and 11 a.m. until 8 p.m. on Sunday, you'll get to enjoy mudbugs for $8.99 per pound -- add sausage for $3 and shrimp for $5. There will also be live music from 3 p.m. until 9 p.m. on Saturday, and from 12 p.m. until 2 p.m. on Sunday. Make a reservation during the times crawfish will be served to ensure your spot on the patio. Saint Arnold will hold a pub crawl in the Sugar Land Town Square this Saturday, beginning at 2 p.m. at the Flying Saucer. Get your punch card between 2 p.m. and 3 p.m. at the Flying Saucer, then hit up five of the six spots along the crawl: Jupiter Pizza & Waffle Co., Stadia Sports Grill, Baker St. Pub & Grill, The Rouxpour, Blu and Guru Burgers & Crepes. Once you complete the Icon Blue Pub Crawl, you'll get a Saint Arnold Pub Crawl pint glass, as long as supplies last. The night will end at 6 p.m. at World of Beer. Sunday Beer Supper @ Caracol Sunday, 5:30 p.m. 2200 Post Oak Blvd. This Sunday, Caracol will offer a Sunday Beer Supper for $65 featuring Saint Arnold beers and Saint Arnold's founder Brock Wagner. The family-style supper begins at 5:30 p.m. with a reception of hors d'oeuvres and Spring Bock, followed by the Lawn Mower Course with pozole verde, a trio of salads and chiles de padron asados. The second main course features the Brown Ale brew with tlacoyo, taquitos tronadores de carnitas and ostiones asadas. Next, each guest will enjoy a Bishop Barrel Sour brew with mixed shellfish, frog legs and rice in a rich broth. The final savory course features the Endeavour brew and includes pork loin with manchamanteles mole and sides of coal-roasted sweet potatoes with condensed milk, wood-fired potatoes and corn pudding. Cap it all off with Santo and tamarind spice cake appropriately served with Santo-infused ice cream.